The lightly refreshed 2014 Hyundai Equus super sedan is expected to reach US shores soon but an engine problem with the freight ship carrying the first batch has left the high end luxury sedans stuck at sea while the crew scrambles to fix the problem – with this drama at sea extending into its second week. The first batch of the 2014 Hyundai Equus headed for North American contains 61 examples of the super luxury sedan loaded onto a Korean vessel named the Morning Spruce. Unfortunately, late last week while cruising through the Sea of Okhotsk – a body of water located between Russia, Japan and the North Pacific Ocean – the Morning Spruce lost power and as a result, the ship has been adrift at sea for going on five days now. The shop spent four days drifting powerless through the Sea of Okhotsk but according to USA Today, the first batch of the 2014 Hyundai Equus has floated into the North Pacific Ocean with a forward speed of 0 nautical miles per hour. 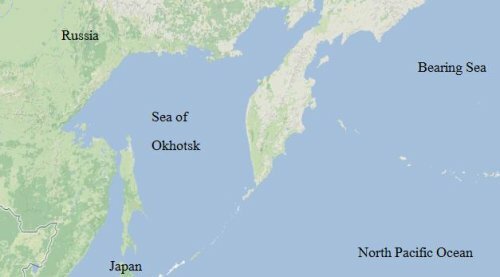 The Map on the right (shown larger at the bottom of this article) shows the Sea of Okhotsk relative to parts of Japan, Russia, the North Pacific and the Bearing Sea. While the idea of engine failure while adrift in the Pacific Ocean might seems dire to many people who don’t have their sea legs even if they were accompanied by a few dozen Hyundai Equus sedans, this type of problem isnt all that unusual. When these large ships are fighting their way around the world, problems frequently come up that leave a ship “dead in the water” while the crew works to fix the issue. An example of this would be the recent problems that have hit the Carnival cruise ships but with commercial freight ships, the crew is better prepared to fix a problem like this without outside help – but these repairs can take time. The crew of the Morning Spruce has spent the last few days working to address the issue and aside from being powerless, the ship is fine so Hyundai isn’t too concerned about the safety of these first 61 2014 Equus. As Hyundai CEO John Krafcik told USA Today – this “Sometimes happens”. However, the delay in the US arrival has caused the Korean automaker to make some changes with their planned marketing launch for their flagship luxury sedan. Full scale marketing efforts are generally timed to coincide with the arrival of a given product at dealerships around the country and with the delivery date now being in question – the company will be forced to delay their initial marketing launch until they know for certain that these new sedans are available for customers to check out…and buy. USA Today reports that the Morning Spruce and its cargo of 61 2014 Hyundai Equus sedans was shown on the website MarineTraffic.com this yesterday morning but the ship is no longer listed so there is a possibility that the ship has limped into port somewhere in either Japan or Russia, provided that the crew wasn’t able to repair the vessel well enough to get back on track or head back to South Korea. Once the Morning Spruce is up and running with the west coast of North America plugged into the navigation system – or once the 61 new Equus sedans have been moved to a different ship (provided that the problem with the Morning Spruce will cause more significant delays) – the company will most likely be able to set a firmer date as to when prospective 2014 Equus buyers around the US can begin lining up for their new 429 horsepower Korean luxury sedan.